Kari is pictured top left along with Nina, top right, and Deirdre, center. “Everyone can be great, because everyone can serve”, said by Martin Luther King Jr. is a quote I now hold dearly due to my newest spring break experience. 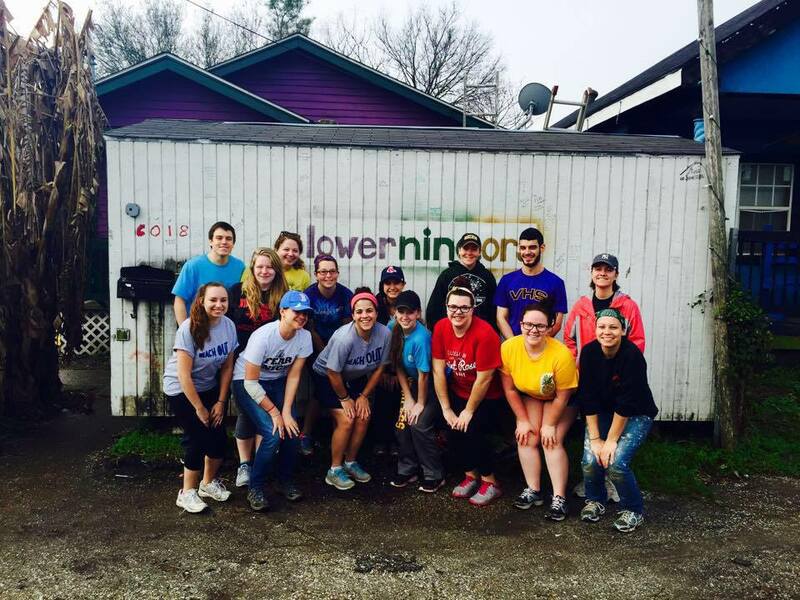 This year for spring break, I chose to break out of my comfort zone and join the New Orleans Alternative Spring Break provided through our college. I am happy to say that has been one of my best decisions ever. Before we went to NOLA, our group had weekly meetings to bond and prepare for our trip. Many people from the group knew at least one other person from the group, but it was hard to determine how we would work as a whole. Not only that, we also learned about Hurricane Katrina and how it affected New Orleans ten years ago. We all knew we were going down to help, but we were not prepared for the condition New Orleans is still in. Getting off the plane we were greeted by sunshine and a nice, warm day. Coming from snowy New York, it definitely lifted our spirits. The area around the airport seemed nice and as we continued to where we stayed we began to be anxious for what lied ahead. That Monday we went to LowerNine.Org’s main base to get our assignment. They were the organization we would work with and we couldn’t wait to help. 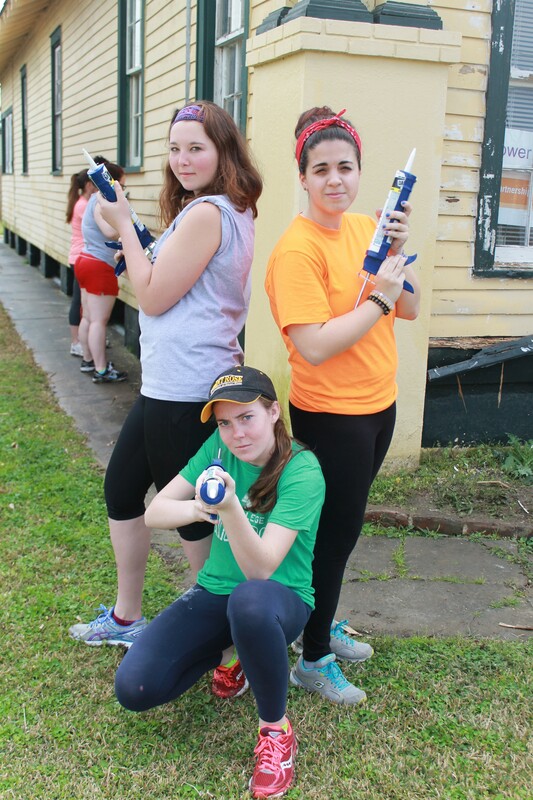 Our group of fifteen was split in half, some went to work on building a roof, and the group I was with painted a house for a day and then went to a house Saint Rose started working on last year to put Sheetrock up. First of all, people think New Orleans is in good condition after ten years, and it is in better condition, but there is still so much to do down there. The tourist parts have been taken care of, but the lower ninth ward, the section we worked in, still has so many people who still don’t have houses and live in harsh conditions. The lower ninth ward is a part of New Orleans that consists predominantly of racial minorities and those of low socioeconomic status. The couple my group put the Sheetrock up for, Mr. and Mrs. Joseph, are still putting their house together after all this time, even though Mr. Joseph is a licensed contractor. Being in New Orleans really showed us that there is so much to overcome not only in the city, but in our country. 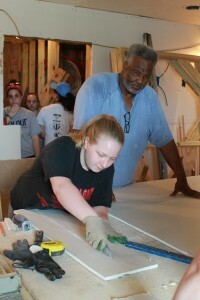 Errol Joseph, homeowner, oversees Sheetrock measurements done by Paige. Our group had an amazing time giving back. The group reflected every night, and it was great to see that not only were we putting in effort and progress, but also it was a progress we could watch transform in front of our eyes. All of us told different perspectives and moments from the day, but sharing and listening really helped everyone reflect. The best part of the week was the last day of service. Our group, other groups, workers of LowerNine.Org gathered at Mr. and Mrs. Joseph’s house. We all huddled into one room, everybody shoulder-to-shoulder, and the Joseph’s gave a speech. They thanked us for our generosity, told us how nothing would be completed without us the volunteers because we are the ones rebuilding New Orleans, and they even told us that whenever we came to visit we were always invited to stay. That’s when everything clicked. Standing in that room with all these incredible people who came to help, to make a difference, and to give back made me realize how important service is. In one week we helped a house come closer to being complete for a couple who deserved that and so much more. We as individuals are like droplets of water, separate we might not do much, but together we make a puddle, and the more droplets the bigger the puddle becomes. That is how service is, when we come together, we can accomplish so much and make such a positive difference in this world. So if you ever want to not only provide help to others, but also grow as an individual I beg you to do a service trip, especially one with LowerNine.Org! It will change your life forever.